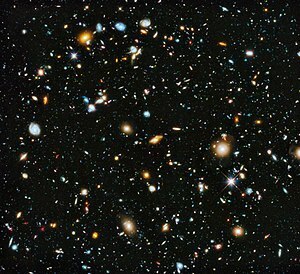 The Hubble Ultra-Deep Field image shows some of the most remote galaxies visible with present technology, each consisting of billions of stars. The image's area of sky is very small – equivalent in size to one tenth of a full moon. ↑ "Hubble's Deepest View of Universe Unveils Never-Before-Seen Galaxies". HubbleSite.org. http://hubblesite.org/newscenter/archive/releases/2009/31/fastfacts/। আহৰণ কৰা হৈছে: 2016-01-02. ↑ Itzhak Bars; John Terning (2009). Extra Dimensions in Space and Time. Springer. পৃষ্ঠা. 27ff. ISBN 978-0-387-77637-8. https://books.google.com/books?id=fFSMatekilIC&pg=PA27। আহৰণ কৰা হৈছে: 2011-05-01. ↑ Paul Davies (2006). The Goldilocks Enigma. First Mariner Books. পৃষ্ঠা. 43ff. ISBN 978-0-618-59226-5. http://www.amazon.com/Goldilocks-Enigma-Universe-Just-Right/dp/0547053584/ref=sr_1_1?s=books&ie=UTF8&qid=1372701918&sr=1-1&keywords=goldilocks+enigma। আহৰণ কৰা হৈছে: 2013-07-01. ↑ NASA/WMAP Science Team (24 January 2014). "Universe 101: What is the Universe Made Of?". NASA. http://map.gsfc.nasa.gov/universe/uni_matter.html। আহৰণ কৰা হৈছে: 2015-02-17. ↑ Fixsen, D. J. (2009). "The Temperature of the Cosmic Microwave Background". The Astrophysical Journal খণ্ড 707 (2): 916–920. doi:10.1088/0004-637X/707/2/916. ↑ NASA/WMAP Science Team (24 January 2014). "Universe 101: Will the Universe expand forever?". NASA. http://map.gsfc.nasa.gov/universe/uni_shape.html। আহৰণ কৰা হৈছে: 16 April 2015. ↑ "Universe". Dictionary.com. http://dictionary.reference.com/browse/Universe?s=t। আহৰণ কৰা হৈছে: 2017-03-13.